That word "yet" expresses a lot, both optimistic and pessimistic, that may be deeply ingrained in the Ukrainian national spirit, as well as it's national anthem. It's a farm country, and that's how farmers think. U.S. Secretary of State John Kerry is scheduled to arrive in Ukraine tomorrow where he will, I suspect, have to explain to the country's new leaders that to save their country's life they will as a practical matter have to give up Crimea. That's not what will be said in public, of course. You can see that Ukraine shows a higher per capita gross domestic product on a purchasing power parity basis than in nominal terms, but that's because a dollar goes farther in poor countries than rich countries, but still not far enough. Not as poor as Moldova, but easily crushed by Russia, should it choose to do so. One can also see why, in looking at the numbers, many Ukrainians want to look West to Europe rather than East to Russia. We could have been Poland, which has 2.8 times the purchasing power, is what they are thinking. But are those rich Europeans who want to expand commercial ties with Ukraine going to send troops to help fend off the Russians? Poland, maybe. The rest almost certainly not. The Russians, of course, are nervous about the expansionist plans of a united Europe. They'd be wise to apply for membership too, but there is too much stupid pride for that on both sides. What about Crimea and its 2 million residents? Another charge of the light brigade across the Crimean peninsula may sound fun, but it should be remembered that while Britain, France, and the Ottoman Empire won the Crimean War of 1853-1856, Russia still got to keep Crimea at the end of it. Crimea was a favorite vacation spot of both Tsars and Commissars. It has a majority Russian population and a large Russian naval base at Sevastopol under lease from Ukraine until 2042 with options to renew. And it is only part of Ukraine due to a blunder of communism. Nikita Khrushchev became head of the Soviet Union in 1953, and in 1954 he transferred Crimea from the Russian Soviet Federative Socialist Republic to the Ukrainian Soviet Socialist Republic. Khrushchev happened to be Ukrainian, and so when the Soviet Union broke up, Ukraine was able to say that Crimea was theirs. 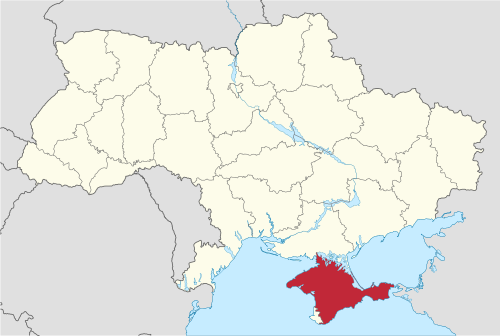 The Crimeans, supported by their old Russians friends, did not necessarily agree that they were Ukrainian and so, after Ukrainian independence, Crimea was established as an "autonomous republic" within Ukraine. Now they will try to schedule a referendum seeking independence from Ukraine. I know some of those people because they immigrated to the United States and became citizens of our country. Like rural farm country everywhere, there's been an incredible brain drain. And of course the continuation of communism by other means has not helped stem the voting with the feet. Still, concerns for family and friends who stayed behind must be high. All that is a way of questioning whether Russia really wants Crimean independence. Maybe they don't, and if we give them a lot so that it won't happen, we may be getting played. The smart play would be to see what concessions can bet got from Russia for Ukraine to let this happen. Putin is not giving up his prestigious Black Sea naval base at Sevastopol anytime soon. The best Ukraine can hope to keep is continuation of Crimea as an autonomous republic within Ukraine. The best it can hope to get ... freedom from Mother Russia. Update: Russian President Putin claims he is not considering "annexing" Crimea to Russia, but "accession" applications in response to a vote in Crimea are another story. The new Ukrainian Prime Minister says he is willing to consider what kind of additional autonomy the Crimean Republic could get. Ukraine still seems focused more on what it can keep than what it can get out of Putin.